Creative Essence: Creatures is a book on sculpting creatures and creature design. The software focused here is Zbrush. This is a 250-page paperback that comes in a slipcase. There's only one standard edition, unlike some of the other artbooks from Ballistic Publishing. 8 leading creature design artists and 3D modelers from the CG industry are featured in the book, namely Andrew Baker, James Van Der Bogart, Jacob Earl, Josh Herman, Ian Joyner, Aris Kolokontis, Ben Mauro, Martin Rezard, Simon Webber and Bryan Wynia. They have worked for a long list of big budget films and video games, such as God of War: Ascension, Uncharted series, The Hobbit trilogy and many more. At heart, this book talks about conceptualisation and the creative thought process of creature design. Interviews with the artists are in Q&A style with them commenting on their inspiration, challenges, the creature they have designed, the story behind and how they live, eat and move. Much is on how to make sense of the design, such as creating a mouth that the creature can actually use to get food. So it's more function with form, rather than form over function. This is not a book that teaches you how to use the Zbrush software, or Photoshop for that matter. You should be at least Zbrush proficient because sometimes the artists do mention technical terms. Overall, just to emphasise again, it's on the creature process of designing. All the creature designs featured are created specifically for the book. They are 28 of them. two-legged, four-legged, monsters, flyers, those with tentacles, insect inspired, dinosaur inspired. There are lots of amazing work to see. All the Zbrush modeled examples are printed in high resolution, with details down to the pores and goosebumps. One artist, Aris Kolokontes has his creatures physically created with clay actually talks about creating goosebumps, and how to make molds. In additional to the Zbrush models, there are also some concept sketches. So you get to see the start and ending product. The actual hard work of pushing and pulling surfaces are not covered, but you do get to see selected step-by-step pictures of creatures being added with details like textures and more precise anatomy forms. 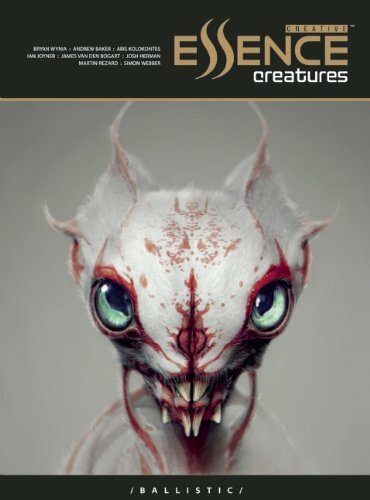 Creative Essence: Creatures is an insightful book into creature design process with wonderful Zbrush sculpted examples. Recommended to intermediate to advanced Zbrush creature designers looking for inspiration. Special thanks to Ballistic Publishing for providing this book for a review. You can preview all the pages on their website.